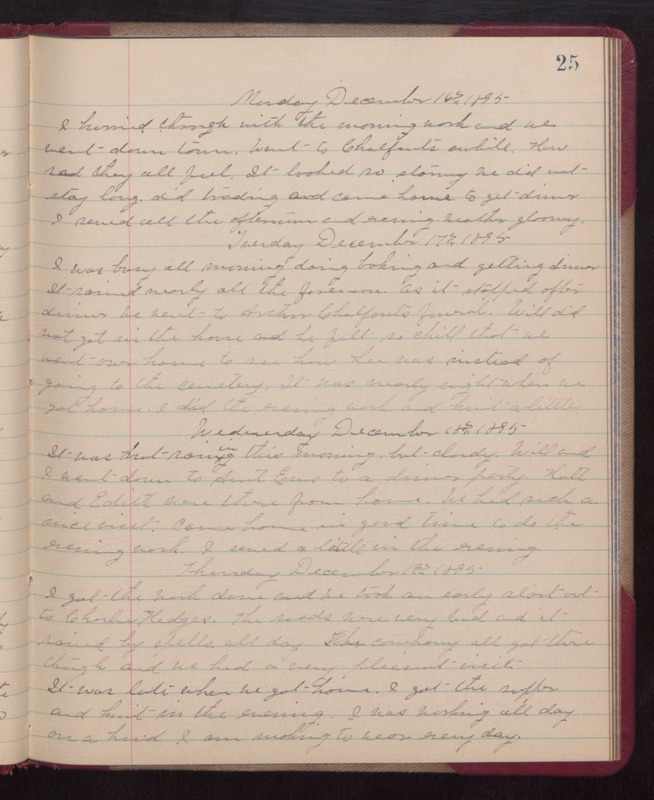 25 Monday December 16th 1895 I hurried through with the morning work and we went down town. Went to Chalfonts awhile. How sad they all feel. It looked so stormy we did not stay long, did trading and came back home to get dinner I sewed all the afternoon and evening. Weather gloomy. Tuesday December 17th 1895 I was busy all morning doing baking and getting dinner. It rained nearly all the forenoon. As it stopped after dinner we went to Arthur Chalfonts funeral. Will did not get in the house and he felt so chill that we went over home to see how Lee was instead of going to the cemetery. It was nearly night when we got home. I did the evening work and knit a little. Wednesday December 18th 1895 It was not raining this morning, but cloudy. Will and I went down to Aunt Ems to a dinner party. Hatt and Edith were there from home. We had such a nice visit. Came home in good time to do the evening work. I sewed a little in the evening. Thursday December 19th 1895 I got the work done and we took an early start out to Charles Hedges. The roads were very bad and it rained by spells all day. The company all got there though and we had a very pleasant visit. It was late when we got home. I got the supper and knit in the evening. I was working all day on a hood I am making to wear every day.